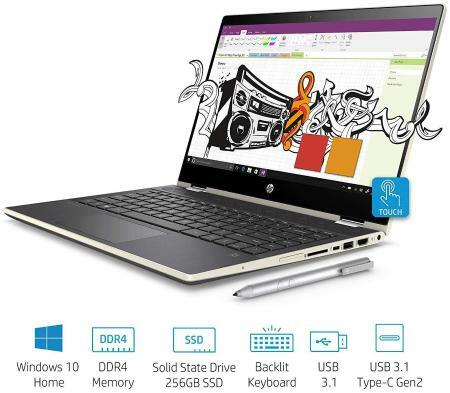 Price of HP Pavilion x360 Convertible 14-cd0081TU 14 inch FHD Slim Laptop with Pen (8th Gen Intel Core i5-8250U/256 GB SSD/8GB RAM/Windows 10 Home (Pale Gold) in the above table is in Indian Rupee. The HP Pavilion x360 Convertible 14-cd0081TU 14 inch FHD Slim Laptop with Pen (8th Gen Intel Core i5-8250U/256 GB SSD/8GB RAM/Windows 10 Home (Pale Gold) is available in Paytm. HP Pavilion x360 Convertible 14-cd0081TU 14 inch FHD Slim Laptop with Pen (8th Gen Intel Core i5-8250U/256 GB SSD/8GB RAM/Windows 10 Home (Pale Gold) prices varies regularly. Please keep on checking our site to find out the latest prices of HP Pavilion x360 Convertible 14-cd0081TU 14 inch FHD Slim Laptop with Pen (8th Gen Intel Core i5-8250U/256 GB SSD/8GB RAM/Windows 10 Home (Pale Gold). What Is The Price Of Laptop Of Dell?